One of the major changes in the redesigned AP Biology course is the requirement that students demonstrate their depth of understanding of biology content through the application of science practices. The AP Biology Curriculum Framework articulates specific learning objectives that merge content with science practice skills (e.g., analyzing data). The learning objectives should not be considered in isolation; they must be taught and learned within the broad context of the entire curriculum framework, which includes the big ideas, enduring understandings, essential knowledge statements, and science practices. On the free-response section of the AP Biology Exam, students are expected to demonstrate their understanding of biology in the context of authentic problems and research. Whether asked to justify, explain, predict, or describe, students must clearly articulate their understanding of the key biological principle(s) or concept(s) underlying the phenomenon being investigated. In short, to be successful on the AP Biology Exam, students must clearly connect a biological concept to a larger big idea or enduring understanding while using designated science practices and skills. On the exam, students must make claims and defend them—providing evidence as part of their reasoning. This should include making appropriate and insightful connections across big ideas and/or enduring understandings. The following student responses from the 2013 AP Biology Exam contrast acceptable responses and incomplete responses. In the first example, the student is awarded full credit (4 points) because the response for part (a) includes plausible explanations connecting changes in amino acid sequences to changes in the structure of the polypeptide produced, and in part (b) the student clearly uses evidence to connect and justify a prediction to a larger biological concept (i.e., the relationship between structure and function). In the second example, no points could be awarded for part (a) because the student fails to provide plausible explanation for observed phenomena; however, the student earns 2 points in part (b) for making a valid prediction and providing justification or reasoning connecting the prediction to a biological concept (i.e., the relationship between structure and function). The table below shows the amino acid sequence of the carboxyl-terminal segment of a conserved polypeptide from four different, but related, species. Each amino acid is represented by a three-letter abbreviation, and the amino acid residues in the polypeptide chains are numbered from the amino acid end to the carboxyl end. Empty cells indicate no amino acid is present. Assuming that species I is the ancestral species of the group, explain the most likely genetic change that produced the polypeptide in species II and the most likely genetic change that produced the polypeptide in species III. Predict the effects of the mutation on the structure and function of the resulting protein in species IV. Justify your prediction. Part (a): 1 point per row for 2 points maximum for explaining the most likely genetic changes that produced the polypeptides in species II and species III. Part (b): 1 point for each reasonable prediction about the effects of the mutation on the structure and function of the resulting protein in species IV, and 1 point for justification of the prediction for 2 points maximum. Protein may have a different structure and a change in function. Change in amino acid sequence of the protein starting at position 5 could alter the overall structure or local structural regions, interfering with function of the protein. Protein may have a different structure and no change in function. Change in amino acid sequence alters the shape/conformation/folding/binding region/regulatory region of the protein, but does not affect the critical functional region(s) of the protein. Protein structure and function may not be affected. Change in amino acid sequence does not alter the protein shape/conformation/folding and does not alter function. This student earned the maximum number of points (4). 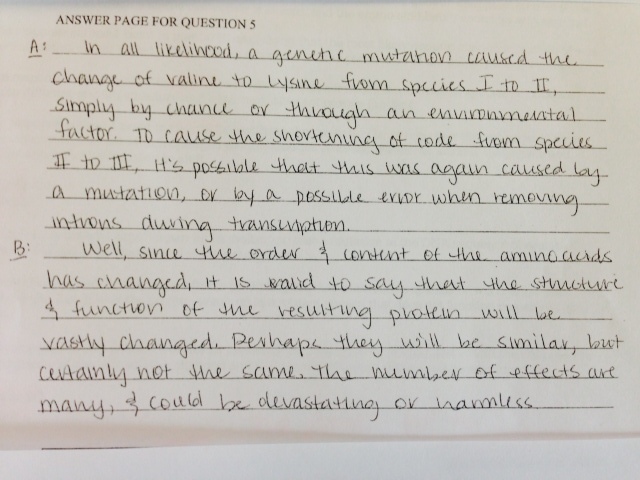 The response earned 1 point in part (a) for explaining that the most likely genetic change in species II was a point mutation in which a single nucleotide is altered, and the amino acid being coded for was changed. 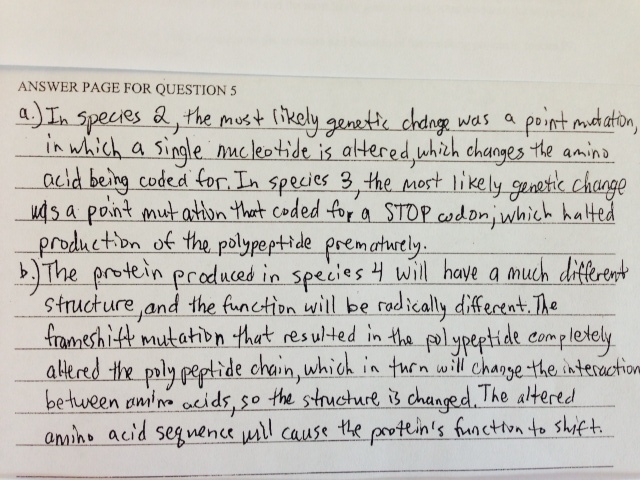 The response earned 1 point in part (a) for explaining that the most likely genetic change in species III was a point mutation that coded a STOP codon, which halted the production of the polypeptide prematurely. The response earned 1 point in part (b) for predicting that a frameshift mutation in species IV causes a much different protein structure and a radically different protein function. The response earned 1 point in part (b) for justifying the prediction by stating that the polypeptide chain was completely altered, which changed the interactions between the amino acids of the protein and caused the protein's function to shift. The student earned 2 points for this response. The student earned 0 points for part (a) because the response did not include plausible explanations for the most likely genetic changes that produced the polypeptide sequences in species II and species III. The response earned 1 point in part (b) for predicting that the structure and function of the protein in species IV will be significantly changed. The response earned 1 point in part (b) for justifying the prediction by stating that a structural and functional change in the protein is due to changes in the order and content of its amino acids.